2016 is the Centenary Year for the Boeing Aircraft Company. It’s now headquartered in Chicago. But for decades it was a product of Seattle and for many Seattle is Boeing town, not just Microsoft. From their remarkable first pressurised Stratoliner 307 of the 1930’s to their creation of the 787 Dreamliner, Boeing, the company with the unique name, was special. For me it always will be. 2016 brings up my 50th anniversary of flight. Despite many iterations and glamorous new inventions by companies such as Airbus and Bombardier, I always feel most comfortable when a Boeing pulls up at the gate for my next flight. By today’s standards I was a late beginner: 16 years of age before I first took to the skies in a powered aircraft. My eldest daughter had already made her first two flights by the age of 8 weeks! I specify powered flight, because six years earlier I’d had a terrifying first flight. It was in a towed glider in Derbyshire in the UK where the pilot, for my 10th birthday, thought it would be fun to call out to a somewhat terrified child – “Oh dear, we don’t seem to have an engine. We are going to crash.” Years later a psychologist extracted this story from me to explain periodic evidence of fear of flying. My first powered flight was one cold November day in 1966. It was in a Westland Wessex helicopter, commandeered by the local regiment of the Royal Green Jackets, more recently amalgamated as The Rifles. I was a Lance Corporal in the Winchester College Cadet Corps. It was the occasion of the Annual ‘Exercise.’ I was deputed, with two other ‘men’ to go behind enemy lines. Our mission: Try and wipe out enemy headquarters through whatever means you can come up with. We clambered into the giant beast, and lay on the khaki-painted, but much-worn metal interior deck. No seats. We grabbed hold of the webbing all around the edges, as we made the ten-minute flight across the fields of Hampshire. It was exhilarating to just “lift off”. No fear, a pure adrenal high! Perfect stuff for a 16-year-old. My overwhelming memory is the noise. How could anything this noisy and this large be clandestine? It’s worth pointing out, despite the noise, we did indeed manage to march, crouch, and wriggle our way right under the noses of the ‘enemy’ headquarters. Only due to the pleas of the monitoring officers did we refrain from throwing our dummy hand grenades into the building above us. Such an early end to the all-day Exercise going on elsewhere would have made the work of 300 other cadets all a bit pointless. Two years later in March 1968, out of school, it was time for my first Boeing experience. I was being despatched to Southern Africa to spend 3 months with my uncle and aunt in my gap year, before going to Oxford University. The destination was the small independent nation of Lesotho. I’d led a fairly sheltered life as an English Public Schoolboy. Flying for 14 hours to a strange city on the African continent, aged 17, having to overnight to await my connection and then take a local propeller plane on another 2 hour-flight to a mountain airport in a place I had actually never heard of until weeks earlier, was an adventure indeed. The 707 used by South African Airways was a high-performance long range version. Due to OAU (Organisation of African Unity) anti-Apartheid overflying restrictions, SAA had to fly around the bulge of Africa and make a fuelling stop in Illha do Sol in the Cape Verde islands. It wasn’t long after take-off for the second long night flight, before a PA announcement urgently called for a doctor. Three bedraggled sleepy gentlemen duly went forward to a hapless passenger. Sadly, he died in his seat, despite their best efforts. It’s something rather more common than you might think. For me I witnessed it on my very first passenger flight. After all the excitement, eventually sleep overcame me, slumped upright, but with much more space than one has in economy these days. The next thing I knew we were approaching Jan Smuts airport in Johannesburg. As I stepped out, the acrid smell of brown coal pervaded the atmosphere. It’s a smell I’d recognise blindfold 50 years later. That first jet flight proved a sharp contrast to my second passenger flight the next day – an ex-military converted Douglas DC-3 – The famous Dakota, in the bright livery of Air Lesotho! Now that really was flying, complete with bouncing rivets in the wings and weaving between thunderclouds, arriving onto a rain-soaked landing strip adjacent to sharply rising mountains – the 2,000 metre Drakensberg range that rakes across the spine of Southern Africa. After University and a couple of years in the retail music and Hi-Fi business, I joined an international company, Bell & Howell. They placed me in their export department. This meant flying to see customers. In my first year I made 62 flights. I parted company with most of my breakfasts in those early days until I got the right type of medication, as I was diagnosed with a very fluid inner ear, Over the years it eased, but heavy turbulence can still produce the same result. I am comforted that Admiral Lord Nelson remained subject to seasickness all his working life as a naval leader. Those years enabled me to sample many different aircraft. Vickers Vanguard, Hawker Siddley Tridents, versions 1, 2 and 3, Boeing 727 and 737, DC-9, Super Caravelle, as well as the glorious BAC-111 twinjet and the less than comfortable prop plane, the Fokker F27. I remember my first flight back from Cologne and the Photokina exhibition of 1972, I was sitting about 5 rows from the front of economy in a BEA Trident 2. The flight dispatcher and senior steward seemed to be in deep discussion prior to the doors closing. Then they descended on two rows of diminutive, patient Japanese executives and asked them to exchange seats with some very stout German and north country English passengers to rebalance the weight in the aircraft. The marginal power of the Trident 2 engines was general knowledge at the time. But it brought it home just how marginal that plane was that such fine tuning was required. Sadly I never made it onto the Franco-British Concorde. Each of the first generation jet planes (no I never flew on a Comet either, which was the real first jet passenger plane,) – had their individual quirks. For example the Douglas DC-8 Stretch, beloved by Belgian airline Sabena was so long and relatively narrow that they used to say that a passenger in the back row would have flown twice as far as a passenger just ahead of the wing, such was the twisting and cavorting of its huge thin fuselage. Sabena suffered the jests of European flyers – Such A Bloody Awful Experience Never Again, was their informal motto. In 1973 I had my first experience of the jumbo jet, the 747-100. A Pan Am late-evening London to Frankfurt routing. 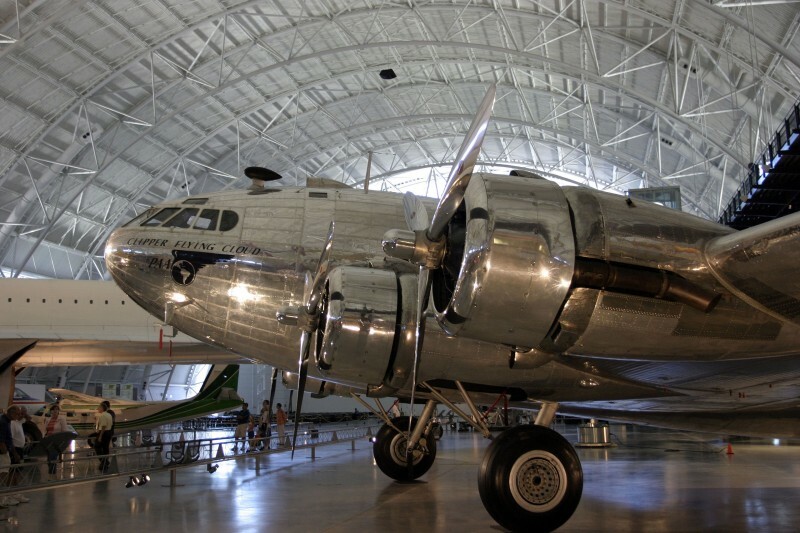 It was part of the then round-the-world route that Pan Am flew, the spirit of Juan Trippe, the adventurous head of the airline that commissioned Boeing to convert their military prototype into a passenger plane. 9-across seating and inflight audio – wow. The 747 changed everything. It lowered costs and it flew 300+ passengers thousands of miles. It wasn’t all smooth sailing. In early flight testing of the 16mm film projector for Inflight movies, which my employer Bell & Howell manufactured, the engineers noticed the image twisting on screen while the plane was in flight. Additional strengthening of the main fuselage with added stringers and beams were added. On a number of occasions in the early seventies my flights were delayed for hours, due to defective engines, a common occurrence in early days. The early High-Bypass Pratt & Whitney JT-9D jets had a knack of failing, (just as the Rolls Royce RB-211 would, but for other reasons, on the Lockheed TriStar.) 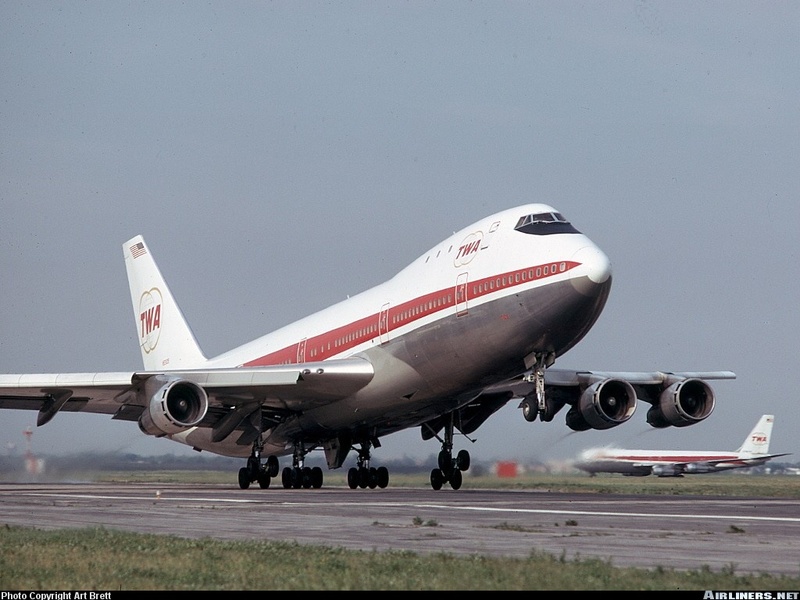 On two occasions on my regular TWA 771 flight to Chicago from London I flew on planes with a spare engine slung under the wing, so short was the supply of engines, they would ferry them between ports as spares. The seventies were both a golden era and also a worrying time to be flying. Planes still fell out of the sky for mechanical reasons. A Turkish Airlines DC-10 from Paris to London crashed outside Paris due to failure of a cargo door locking system in 1974, and consequential damage to control lines that made the plane unflappable. My wife-to-be, 3 weeks later, missed being on THAT flight by 4 seats. BEA (later British Airways) was on strike. At Orly airport they lined up all passengers holding BEA tickets and allocated them to seats on other airlines that plied the short 40-minute hop. It was her lucky day that the plane was full four passengers before they got to her. She went on an Air France plane a few minutes later. Until today she reflects on those football players she was joking with an hour earlier as they all waited to get on the next available plane. That same day, March 3rd 1974, I was on a Lufthansa Boeing 737 Cityjet flight from Frankfurt. It was diverted away from Amsterdam when a hijacked BOAC VC-10 plane was blown up on the ground at Schiphol, just as we approached the runway to land. Quite a day! (interestingly they recovered the tail of the aircraft and used it for spare parts. By then production of the VC-10 had ceased. A year later I was on a McDonnell Douglas United DC-10 out of Chicago O’Hare airport when the compressor on the port/left engine blew 15 minutes into the flight at around 14,000 feet. It was an uncontained failure. Engine parts were ejected from the early-generation GE CF-6 engine, one smaller part hitting the underside of the wing, which one could distinctly hear and feel. A smell of kerosene quickly entered the cabin. The plane stabilised, after what seemed a lifetime, the Captain’s calming voice came on to reassure us, and we returned uneventfully to Chicago. I was pretty glad to be on the ground that day, and consumed an unusually large number of brandies before boarding a replacement aircraft. Just a month later an American Airlines DC-10 had an engine fall off just as it rotated for take-off from the same airport, killing all on board. It took me several years to fly again without extreme panic, and I suppose I started being very picky about my choice of plane. Boeing was best. The Airbus A300 had arrived on the scene by then – the first large two-aisle twin-jet. It seemed hardly possible that such a large plane could lift-off, let alone fly, with just two engines. But its success changed the dynamics of medium range flights, and for the first time since WW2, Boeing had serious competition. All the more remarkable this large plane won the favour of America’s Eastern Airlines and started to fly in US skies, something that had not happened since the BAC-111. Boeing’s response was the smaller point-to-point 757 and 767 medium range twin jets, still flying today. As if to rub salt in the wound, Airbus followed up, soon afterwards, with the single aisle A320, launched in the 1980’s. Thirty years later it leads production volumes, as it ramps up production of its next generation NEO version, with hyper-efficient geared-fan propulsion from Pratt & Whitney, who now depends on this new engine for its future. Boeing was making as many single aisle planes as it could in the ‘80’s – the 727 was coming to the end of its production life by 1984. That year Boeing launched the 737-300, longer, now with the CFM-56 large turbo-fan engine that dramatically improved the plane’s economics. Thousands were made, as well as an extended capacity version the 737-400. But, even Boeing had engineering challenges. These venerable planes were ultimately found to have a serious rudder defect that caused two major crashes. Changes were incorporated in later models, as well as the existing fleet, making the 737 the most successful jet aircraft of all time. Its latest version the 737 MAX flew its maiden flight in recent days in January 2016. 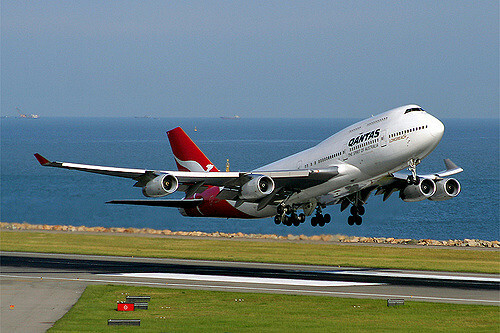 I remember my first Trans-Pacific non-stop flight on a 747-400. Until the -400 came along a middle of the night stopover and customs arrival procedure was required in Honolulu. With the new plane, in the late 1980’s, suddenly a 14-hour non-stop flight was possible. It chopped 3 hours off the trip. If you were lucky enough to fly Business Class (Qantas invented the concept with what was essentially once a First class seat) you could stretch out on a big armchair with legroom over 40cm greater than regular economy. It all felt so luxurious. Today Business Class is almost universally lie-flat, and seat pitch is an amazing 180 cm. Strangely the quality of sleep does not seem to have gone up proportionately. But it makes any other kind of long distance flying seem pretty dreadful. I last flew on a 747-400, this time with the special-to-Qantas extended range GE engines, back from Japan in 2015, 43 years after my first flight on a 747. I flew on the same TWA 747 that years later exploded and burned up just out of New York in 2001. I flew routes that had fatal accidents on flights I regularly took for business. Engines have failed, fires have erupted in air-conditioning, lightning has struck from time to time, and turbulence has parted me from my lunch more times than most people have flown. But it is still a wondrous experience. Boeing has made the world a smaller place. As the 747 fleet rapidly declines in number, replaced by next generation planes such as the ground-breaking largely Composite Boeing 787 Dreamliner, and the forthcoming 777-X, or the giant Airbus A380 and its smaller sibling the new A350, much of the grace of flying has gone. Throughout my business career flying around the world, technological safety and capability has improved beyond measure, just as comfort has declined for most passengers. Flying is so safe today due to meticulous review of all incidents, accidents and crashes, learning from the cases and implementing methodical improvements to products and the process of flight. Having suffered a DVT (Deep Vein Thrombosis) from inadequate motion over a 24-hour flight a few years ago, I know just how risky flight can be to the human body. Sadly, I am equally concerned that flight automation is slowly diminishing fundamental flight skills for many pilots. Training today is not instilling enough understanding of basic flight control. Once upon a time one could be very confident of the men and women up-front in times of crisis. As we saw in the Southern Atlantic with Air France’s A330 breakup in a thunderstorm and the Asiana 777 crash into the runway in San Francisco in recent years, all too often now dependence on programmed automation is progressively removing fundamental skill and knowledge of flight from a new generation flyers. The ex military seat-of-the-pants manual flyers are replaced by people who may never have flown aerobatics or basic single engine planes like the legendary Cessna 180. I have a fundamental faith in Boeing aircraft. Once on a Air New Zealand 767-300 flight from Auckland to Sydney, the No.1 engine failed and had to be shut down about 25 minutes into flight. Now flying on just one engine the captain calmly announced he’d be putting out the wheels, lowering flaps and raising the nose to help burn off fuel. “Since we have some time to kill let me take you on a low level sight-seeing tour of the west coast north of Auckland.” It was spectacular, calmed everyone on board, and convinced me of the fine redundant strength of design inherent in these great craft, not to mention their excess safety bandwidth power. Perhaps before I turn in my drivers license I might one day go up in a small single-engined Cessna and take the controls. Many a time did I spend up to an hour in a cockpit of a modern jet and study flight management and chat with pilots through the long nights of flight. I developed modestly good flying skills on Microsoft’s once-popular Flight Simulator program on my own PC. I have enjoyed a couple of flights into the old Kai Tak airport in Hong Kong with its scary curved approach, in a real flight simulator. I did manage to land the 737-300 on both occasions. And once, thanks to a cousin who was an Air New Zealand Captain, I sat in the jump seat of a 747-300 for take-off and landing from Sydney to Auckland. Those pilots earn every cent in those critical periods of flight. Boeing is 100 years old in 2016. Manned flight itself is only 113 years old. (Orville & Wilbur Wright, 1903). We salute the ingenuity and inventiveness of those who create amazing flying machines. The world IS a smaller place, but it still has much to learn to bring peace and harmony. Over 100 million Chinese will leave China for an overseas trip this year. When I started flying the only Chinese allowed to travel wore special grey suits and had to be of influence in Mao’s inner circle, or be directed by a Chinese minister to fly overseas. Without the ability to move millions of people each month today’s world could not function. The city of Dubai will process close to 100 million passengers this year. When I started flying there was a dusty airstrip amid the 50,000 locals in the UAE, and that was it. To William Edward Boeing; to all the hundreds of thousands of workers down the ages: Thanks for making possible modern pressurised flight. “If it ain’t Boeing, I ain’t going” has been a sound basis for safe flight thus far. Long may they continue to create the world’s greatest passenger airplanes. All rights reserved. Text © Copyright John Swainston, 2016.